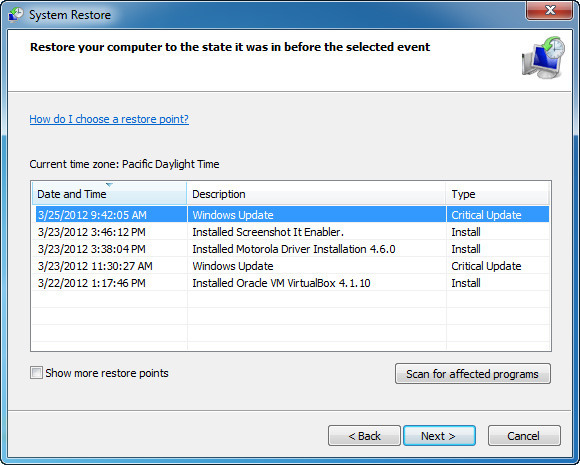 To activate System Restore per partition, go to System Properties and turn the protection On. Note that the data protection feature is not supported by FAT32 partitions. 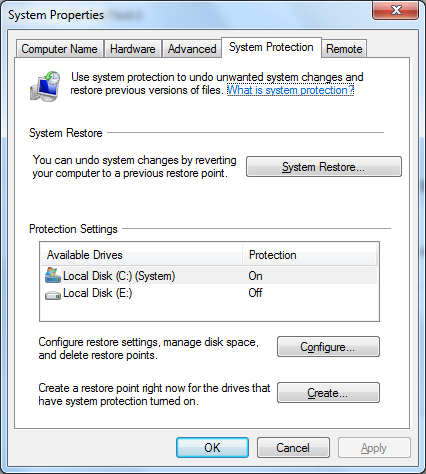 After you turn the protection on from the Protection Settings tab, create an actual restore point using the System Restore button on the same screen. If everything is OK you should see your restore points in the screen below. If you are using Windows 7, however, you will quickly discover that this setting is not working. 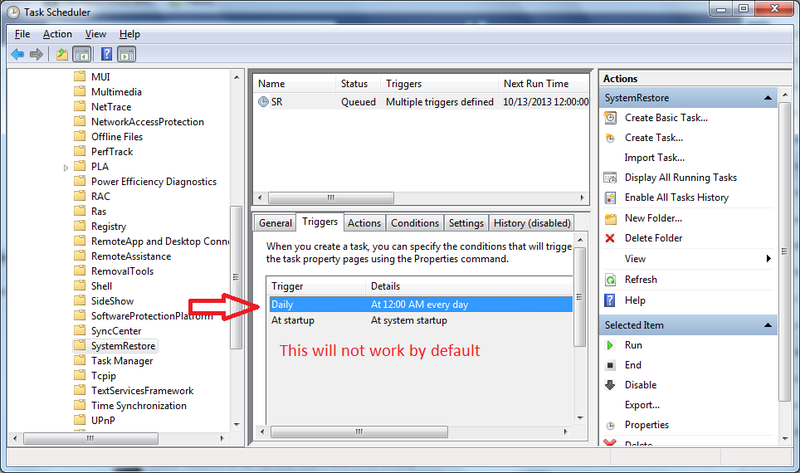 In fact, this is a default behaviour in Windows 7, if there are any restore points created during the past 7 days, the trigger will not execute. This is not the same in Windows XP, for instance, where this setting seems to work. To be honest, I couldn’t find a direct solution to this issue. But it seems that the Windows Backup system doesn’t have this limitation, and when you create a backup an automatic restore point is being created as well. So what I did is I basically configured System Backup to run on daily basis, indirectly configuring the System Restore too. 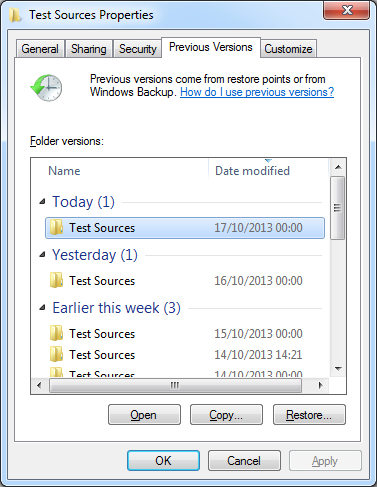 What’s the difference between System Restore and Windows Backup ? The difference between System Restore and Backup is that System Restore effectively compresses and stores all the system-related files and configurations (System files, registry settings, programs installed on your computer, scripts, batch files), while Windows Backup takes care of all the non-system related information (like your personal files, such as e-mail, documents, photos, desktop as well as non-system partitions). Windows Backup also doesn’t work on FAT32. But isn’t the Windows Backup feature too cumbersome, aren’t the creation and restoration parts going to take too much time ? Well, it depends on how confident you are in your ability to not screw everything out. And frankly, I’m not confident at all. One additional argument in favour of using system restore and Windows backup regularly is the Restore Previous Versions feature. To open this windows, simply right click on your file/folder and select Restore previous versions. As you can see, this comes pretty handy in case you accidently delete some important file/folder, or your favourite development environment does that for you.